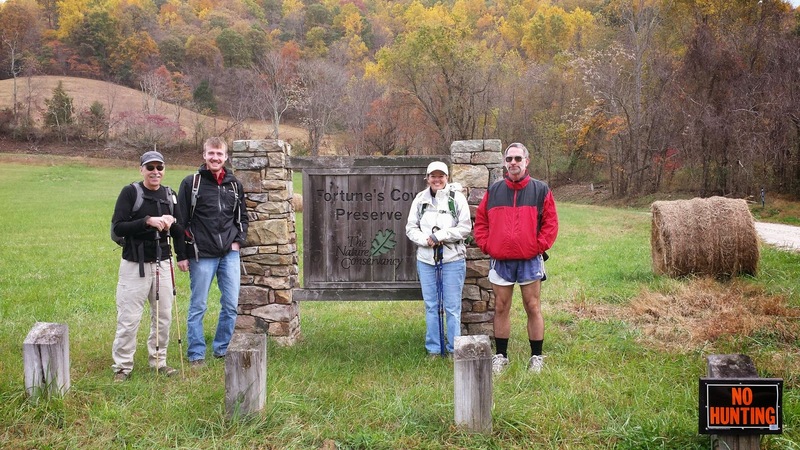 Five hikers came out on Thursday, November 20 to brave the cold temperatures and enjoy the 8.2 mile loop from Three Ridges Overlook connecting the old Appalachian Trail to the new Appalachian Trail. We left the Blue Ridge Parkway at 2600 ft. and climbed into the woods following the 30 year old white blaze markers up into Wintergreen. Coming out at Cedar Drive and 3600 ft. we followed the red blazed Perimeter Trail/Old Appalachian Trail markers. Much of the path had clear views of Torrey Ridge and the Shenandoah Valley. Gorgeous this time of year...and why we like winter hiking- great vistas, invigorating weather, and no insects! Lunch on Cedar Cliffs about halfway, which is right across the way from Dripping Rock and where the old AT intersects the new AT. We continued south towards Three Ridges Overlook for the next few hours. 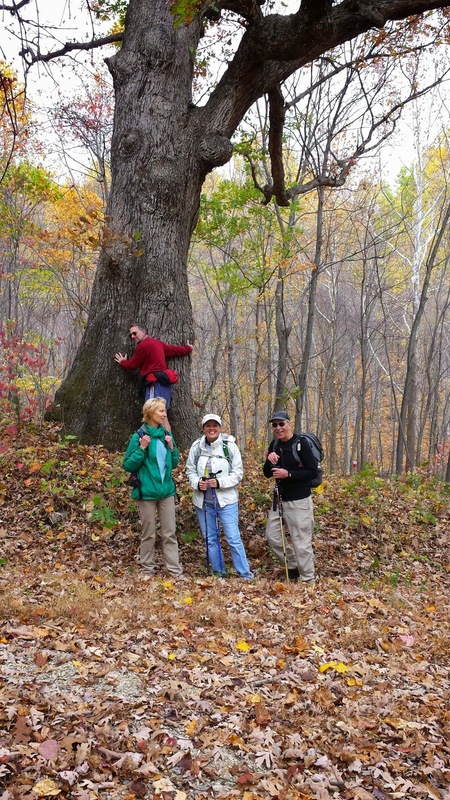 Hike leader Kelly O’Rourke- was joined by veteran’s Dave Borzych and John Brandt and new hikers Claire Cline and Patrick Doyle (new to C-ville) to enjoy a nice hike at Fortune’s Cove. We were fortunate (J) that it did not rain…chilly at the top so lunch was not a long. Still we all did both loops for a total of 8.3 miles with a total elevation +2223 according to MapMyHike GPS tracker. After the hike we stopped at the nearby winery Mountain Cove (they said they are the oldest winery in VA). How does a temperate, sunny Fall day climbing up 1650 vertical feet of rock and boulders in a mile, followed by an hour of bushwacking BEFORE lunch sound to you? If this is your kind of fun, Pete Fink’s hike would be the one for you. Though clearly not a hike for everyone, the 5 hikers who headed out on this chilly morning with an 8 AM start time were very glad they spent their Saturday at Devil’s Marbleyard near Natural Bridge. While at least 2 folks (you know who you are) missed the early start time, Pete and his lovely assistant Bev, John Brandt, Iva Gillet and first time PATC hiker Christine Brennan, began the day’s adventure hiking up the Belfast Trail at 10 AM. A mile later we met a wilderness ranger, Eric Giebelstein, at the base of the rock scramble. The topography here was similar to the White Mountains in New Hampshire, with no definite trail and a mile of rocks and boulders to haul yourself over and around. It was TERRIFIC! Everyone picked their way, though we were careful to stay within eyesight of each other. Christine and John reached to top first and soaked up the awesome vista. 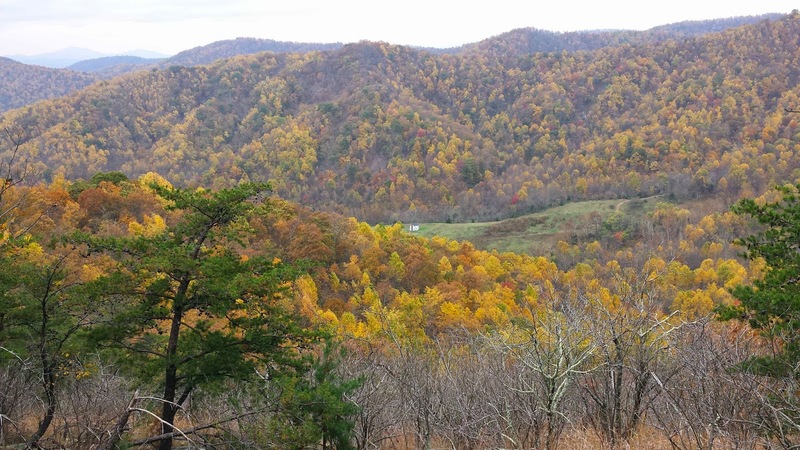 The views on the ascent were glorious with the Fall foliage. We had a snack at the top of the scramble, enjoying the left-over Halloween candy from Pete and Bev. As we began our bushwack to the trail, we spotted a campsite with trash, including several plastic water and Gatorade bottles. We decided to carry it out, utilizing the Leave No Trace principles. Tying the trash in a grocery bag to the outside of Iva’s pack went well for a time, but somewhere mid-bushwack, we had to stop and rearrange, since John Brandt had been recollecting the bottles from the battered bag which was ripped to shreds by the trees and brush. After following Pete’s GPS through the woods, we arrived at last at Gunter Ridge Trail which took us up to the AT. We were then allowed a 15 minute lunch! Leaves make Fall hiking breathtaking- both with the colors and the treacherous way they cover the trail. We had to be attentive as we hiked, since you never knew what was under the leaves. I believe we each slipped and fell at least once during the day, though no injuries. After lunch (and more Halloween candy) we hiked the AT toward Petite’s Gap for a ways, in order to see a helicopter landing site for wilderness emergencies. There were several Scout groups backpacking this lovely day. Pete was attentive to the time as we all wanted to be off the trail before sunset, so once we visited the site of the old AT, we retraced our steps. Fortunately, instead of the bushwack and Marbleyard, we descended on the parallel Belfast trail. It wound down the side of a lovely gorge with the rustle of the leaves as we returned. We descended carefully on the slick rocks and through deep leaves. As we passed the base of the Marbleyard, there were many more people than when we had started hours ago. This is a popular spot with young people, but we mature folks get to enjoy it too! As we exited the Wilderness area, there were two campsites of Scouts with their campfires burning. Pete and John made sure that the adults were vigilant about the fires as we re-emerged from our fabulous day hiking. On a perfect day to be outside, eight people met at Two Mile Run overlook to hike out to the summit of Rocky Mount. There were still many brightly colored leaves. Around noon we were still climbing up Rocky Mount as people wondered how much further there was to go. Not remembering all the turns, I did not make any promises about being almost there. When we did reach the summit, we spread out on the rocks for lunch which included some orange and cranberry in an energy loaf. Just after we started back, we went to another overlook where there were no trees blocking our view. Séverine Fremy took many pictures of the new sights. couple of small ones. With our stops to enjoy the sights, we arrived in Charlottesville after most of the football traffic had gone.